Meet my happy sunshine lentil bowls, guys! Is it a brunch bowl? A lunch combo? A dinner mash-up? 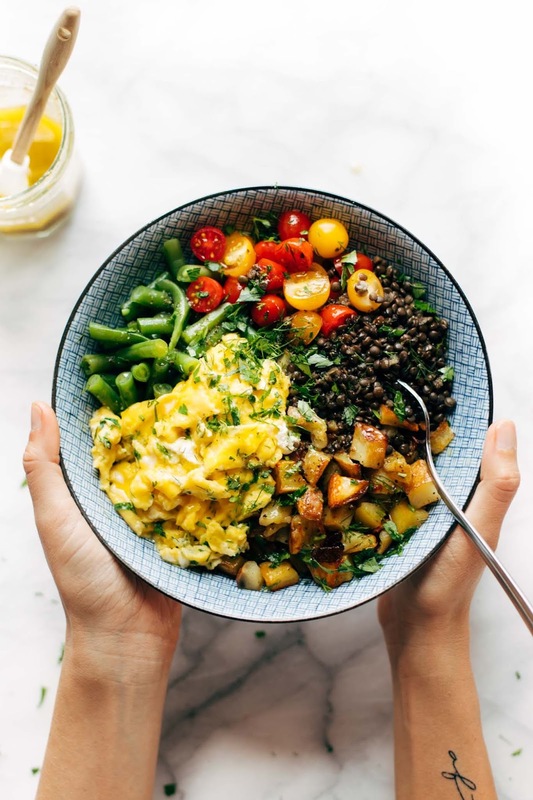 It’s a nutritional powerhouse with roasty potatoes, fresh green beans, summery tomatoes, herbs upon herbs, soft scrambled eggs with goat cheese, and of course, a nice hefty pile of those tiny black lentils. Sprinkle with seeds or nuts. Squeeze a little lemon juice over top, maybe drizzle with a little homemade garlic-and-olive-oil Italian dressing. Hit with some salt and pepper. Oh my gosh, NEED. Need, need, need. It’s my favorite thing to do with food: make myself fall so much in love with foods that are basically the equivalent of winning the nutritional Olympics. Related: helps offset all the marshmallow cream consumed from those s’mores bars. Balance is the name of our game, and summer can be brutal in the most delicious ways, so on the days when I can get it together, this is how I feed my body some happy sunshiney food. Sunshine Lentil Bowls featuring garden produce like green beans, tomatoes, herbs, roasty potatoes, soft scrambled eggs with goat cheese, and lentils! lots of lentils. My favorite way to do a clean eating reset between all those summery treats. Dill and/or parsley, basil, etc. Prep Vegetables: Cook your lentils, roast your potatoes, blanch or steam your green beans. Dressing: Make the dressing by running everything through a blender until smooth. Yummiest Eggs: In a small nonstick skillet over low heat, add a tiny knob of butter. Whisk your eggs really well in a separate bowl, season with salt and pepper, and pour into the pan. Wait for a minute, then using a soft rubber spatula, gently scrape the edges of the skillet, moving the eggs around in the pan. Wait for a few seconds after each turn of the spatula, and then repeat. You should be getting big fluffy curds. When the eggs are almost fully cooked, add a few chunks of goat cheese and a little pinch of herbs and then remove the pan from heat, letting the cheese melt and the eggs finish cooking off-heat. 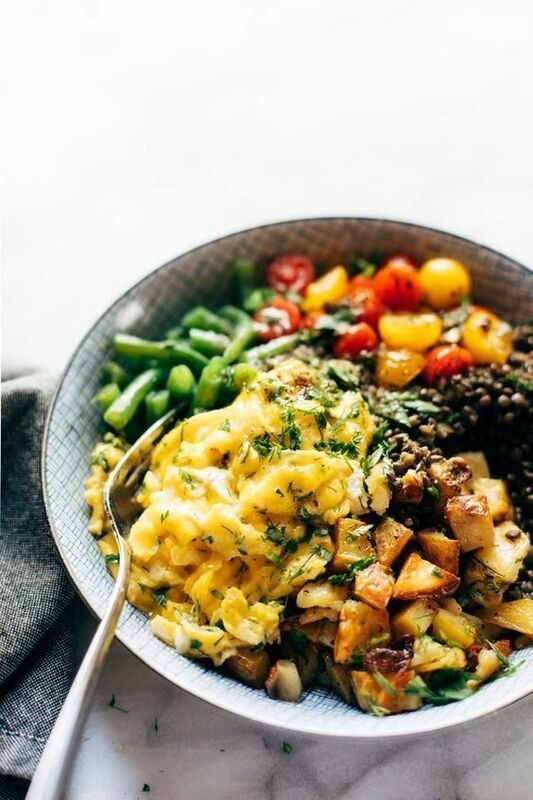 Add the eggs to your bowls and dress with salt, pepper, lemon juice, dressing, whatever you want. 0 Response to "sunshine lentil bowls with garlic olive oil dressing"